The Mazda MX-5 Miata is a two-door, two passenger roadster. The Mazda MX-5 Miata is one of those vehicles that almost needs no introduction. Ever since it appeared on the scene in 1989, the Miata has succeeded in re-defining driver expectations for how a two-seat roadster should comport itself on both the road and the track. With a low curb weight, responsive 4-cylinder engine and high fun factor, the Miata roadster was a breath of fresh air into an otherwise stale automotive decade. While the intervening years have seen most vehicles begin to tilt the scales towards heavier and heavier weights, Mazda has fought hard to keep the Miata true to its original, sprite-like spirit. The 2008 Mazda MX-5 Miata has been riding on its current platform for 2 years, having last been updated for the 2006 model year. The most significant characteristics of the newer Miata are the addition of a power hard top, which was added in an effort to make the vehicle more practical in a variety of different climates. While it may seem unusual for the makers of a two-seat roadster to be concerned with practicality, the ‘coupe’ option for the Miata has been popular. Amazingly, even with the extra weight of the hard top the Miata remains within 300 lbs of the original generation, allowing it to maintain the nimble handling for which is has become famous. There is only one engine available in the Miata, a 166 horsepower, 4-cylinder engine which makes 140 lb-ft of torque. While this might not seem like much given the current automotive climate of lofty power figures, it is more than enough to make the lightweight Miata a blast to drive in almost any situation. The tight chassis and well-designed suspension make the vehicle ideal for country road slaloms or even weekend track duty. The Miata is a driver’s car, committed to providing as pure an experience as modern safety and electronic equipment will allow. For such a small car, it certainly does come in a wide range of trim levels. These range from the base SV to the Sport, Touring, Grand Touring and Special Edition – 5 trims in all. The first two levels come with a 5-speed manual transmission, while the upper 3 are outfitted with a 6-speed manual. All but the SV can also be equipped with a 6-speed, paddle-shifted automatic, but this seriously detracts from the sporting nature of the vehicle. Interior comforts are largely to be found in the Touring and Grand Touring range, which add leather-esque accents, leather seats and a leather wrapped steering wheel. The Special Edition upgrades the quality of the hides on the seats, and also adds some extra decorative trim. The 2008 Mazda MX-5 Miata offers drivers a way to commune with the road to a degree not often found in modern vehicles. Not only that, but the small vehicle offers excellent fuel economy – 28 miles per gallon on the highway and 21 in town with the 6-speed manual. A test drive should definitely be on the list of any serious automotive enthusiast who enjoys balanced handling and the wind in their hair. The 2009 Mazda MX-5 Miata has had a few changes made to its exterior design since the last model year. There are several small design changes both the front and back of the vehicle. 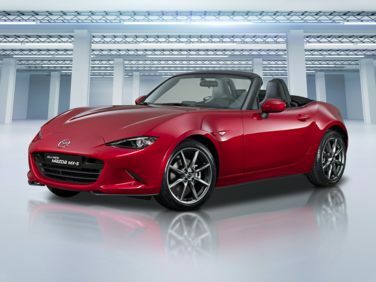 On top, there is a new power retractable hardtop that is now available on the MX-5. This is in addition to the cloth top and the vinyl top. The 2009 has five trim levels available. The base trim level is the SV. The upgraded models are the Sport, Touring, Grand Touring and the Special Edition models. The base level SV and the LS level both have a 1.8 liter, four-cylinder engine that can produce 142 horsepower. And 125 foot pounds of torque. The engine has an iron block and has a cylinder head made from aluminum alloy. There is a choice between a four-speed manual transmission and a five-speed manual system with overdrive. The MX-5 Miata drive train comes with rear-wheel drive and a stabilizer bar. It has four-wheel independent suspension. The 16-inch wheels are made from alloy and the vehicle comes equipped with P205/45WR16 performance tires and a space tire with a steel wheel. The brakes are ventilated in the front and solid discs in the rear. The vehicle comes standard with intermittent wipers, a rear defogger, an airbag deactivation switch for the passenger seat, an emergency interior release for the trunk, pretensioners for the front seatbelts, cloth upholstery, power windows, a remote trunk release, front floor mats, storage in the front seatback and power windows that work with one touch. Safety features for the MX-5 include four-wheel anti-lock brakes, front impact airbags for the driver and the passenger, side impact airbags for the driver and the passenger, an occupancy sensor, head protection for the driver and the passenger and side impact bars and an ignition disable feature.